Remember When Drake Flirted With Serena Williams on Twitter Back in 2011? Take a Look! The world is still freaking out over the news that Drake and Serena Williams are a thing, but guys, Drizzy's been plotting this for some time now. Their romantic relationship may be very new, but his interest in the pro tennis player is not. In fact, the OVO rapper openly expressed his admiration for Williams four years ago when he tweeted the athlete with a hilarious message that had a very obvious sexual undertone. In August of 2011, Drake wrote, "@serenawilliams I cannot wait to put it on you and make you sweat..........during our match this weekend." LOL! @serenawilliams I cannot wait to put it on you and make you sweat..........during our match this weekend. The new couple alert emerged after photos of these new lovebirds engaging in a steamy makeout sesh at a restaurant in Cincinnati on Sunday hit the Internet. E! News has learned that the two, who have been friends for some time, have been talking romantically for the past month. 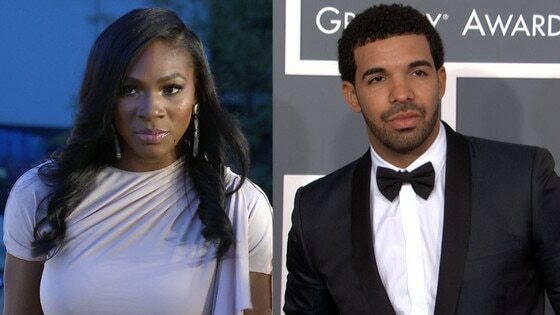 We're told their budding relationship is very new and the duo does not yet have a title, but Drake has always been a big fan of Serena and she is very much his type. The insider added that the rapper and the athlete are both going with the flow for the time being. Earlier in the day, Williams won the WTA's Western & Southern Open with Drake on hand to lend his support. A Twitter user shared a video showing the rapper smiling ear-to-ear at his new lady, who was on the court. Williams also posted a photo on Instagram referencing her second consecutive win writing, "#backtoback in Cincy. Good for the #dynamicduo @patrickmouratoglou #ontothenextone." Back to back, ey? Funny, that's also the name of Drake's recent track. The "Started From the Bottom" rapper was also spotted at Wimbledon last month, and he Instagrammed a shot of Serena after she claimed her sixth Wimbledon title. "Showtime Champ. A big plate for all that food you ate at Wimbledon!" he wrote. While neither Williams nor Drake have commented on their romance, it's fair to say that the public has given its stamp of approval.